Oliver Ortmann was born on the 11th of June 1967 in Hamburg Germany and in the pool world is known by the nickname 'The Machine'. Ortmann is certainly one of the most successful players to come out of Europe, first bursting onto the scene when he defeated Steve Mizerak to win the 1989 US Open 14.1 Championship. Since that time he has won over 40 German championship and over 25 European championship medals. In 1995 he managed to win the WBA men's 9 ball championship becoming world champion. 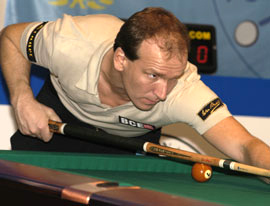 In 1996, Ortmann was successful in winning both the European 8 ball and 9 ball Championships - both titles he has managed to win on several occasions. In 2004, Ortmann formed billiard supplies company ortmann-billiards.com a company which sells pool products. In 2007, Ortmann won the WPA World Straight Pool Championship defeating Huidji See, 200-171 in the final. Iin the process he made the 3rd highest run of the tournament. Oliver who uses a Kruger cue by BCE, enjoys swimming, playing cards and listening to music in his spare time.